Let go of pains and hurts of past problems. The Angels of ForGIVEness will walk you - step by step - through a very easy process of release the pains and hurts of past events. Gentle and effective. Used effectively by children to elders. 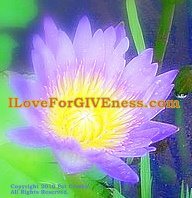 ForGIVEness ~ untangling and unsnarling of our own old twisted patterns, blocks and knots that keep us from moving forward into our birthright of light and love. Releasing and letting go of old past imprints and patterns that do not serve us. Call on the help of the Angels of ForGIVEness to help you release, allow, and let go. ForGIVEness is NOT denying, rationalizing, justifying, excusing. ForGIVENess IS allowing the painful hurts and pains and knots in your heart to be released so YOU can move forward with lightness, grace, and ease. This very short, powerful meditation will give you years of release and comfort along the journey of life. Suitable for all spiritual, self-development, self-improvement sites that believe in Angels. "There are very few things more counterproductive than holding a grudge. In this little gem, Pat Crosby shares a method for forgiveness that can provide you with more happiness, joy, peace of mind, and financial success." "There are angels among us. I know. I met one. Her name is Pat Crosby and she is here spreading the Power of Forgiveness with her magic golden particles. Breathe them in and untangle your life." "Pat Crosby is a true Earth-Keeper. Her depth of understanding teamed with her extensive travels to sacred sites all over the planet have given her keen insight and wisdom that are clearly reflected in this book. It is a must-read for all on the path." "Pat Crosby is a heartfelt essence of love, with an insatiable desire to spread her light and touch people where they can heal. "She lives the truth: "To find peace, you must pierce the veils of separation and awaken your spirituality. "...the darkness becomes part of the light, and the light shines within it. What happened to the dim that was surrounding you? "Has it moved away from you? No, it lit up all around you. Isn’t that a beautiful thought? That is how you piece it together, one heart at a time.". *We could all use this book! You are a true INSPIRATION!"